Michael M.E. Johns, MD, former Emory University Chancellor and former Executive Vice President for Health Affairs will receive the 2015 Castle Connolly National Physician of the Year Award for Lifetime Achievement. The award will be presented on March 23, 2015, in New York City. The National Physician of the Year Awards recognize both physicians and leaders in health care whose dedication, talents and skills have improved the lives of thousands of people throughout the world. This event is a tribute not only to the awardee but also to the excellence of the many thousands of practicing physicians throughout the nation. Before becoming Emory University’s fifth chancellor on October 1, 2007, Johns served as CEO of the Robert W. Woodruff Health Sciences Center (WHSC) and as Emory Executive Vice President for Health Affairs from 1996 to 2007. The WHSC includes Emory University School of Medicine, Nell Hodgson Woodruff School of Nursing, Rollins School of Public Health, Yerkes National Primate Research Center, Winship Cancer Institute and Emory Healthcare, the largest, most comprehensive health care system in Georgia. During Johns’ tenure as CEO, he led a comprehensive strategy that positioned the Woodruff Health Sciences Center as one of the nation's preeminent academic health centers in education, research and patient care. 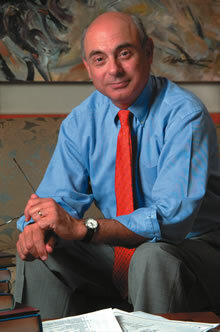 He initiated the drive that resulted in National Cancer Institute Cancer Center Designation for the Winship Cancer Institute, and the research enterprise was re-energized, resulting in funding support for the center's biomedical and behavioral research more than doubling over 10 years to $331 million by 2007. Johns also led one of the most extensive facilities improvement plans in the Woodruff Health Sciences Center's history. Highlights include a new biomedical research building, a new nursing school building, a new vaccine center building, a new Winship Cancer Institute building, and the reconfiguration of Emory University Hospital Midtown campus. From 1990 to 1996, Johns was dean of the Johns Hopkins School of Medicine and vice president of the medical faculty at Johns Hopkins University. Under his leadership, the Johns Hopkins medical school moved into first place among all medical schools in sponsored research. Johns, an otolaryngologist and head and neck cancer surgeon by training, and current Professor in the Emory University School of Medicine and Rollins School of Public Health, continues to be a significant contributor to many of the leading organizations and policy groups in health care, including the Institute of Medicine, the Association of American Medical Colleges, the Commonwealth Fund Task Force on Academic Health Centers, the Association of Academic Health Centers, and many others. He frequently lectures and publishes, and works with state and federal policy makers, on topics ranging from the future of health professions education to national health system reform.